The electrification of the Pennsylvania Railroad, using alternating current, began in 1915 when an 11,000 volt A.C. catenary was run over twenty miles of the main line from the Philadelphia Broad Street Station to Paoli, PA. This project was undertaken to help eliminate congestion at the Philadelphia station. The plan was to use MP54 electric MU cars, which could be operated from either end, eliminating the need to detach and turn steam locomotives. Also the electric car had a more rapid acceleration which further reduced running times. The plan worked well and by 1927, most of the Philadelphia suburban lines were using the owl-eyed MP54s. A real break through occurred in 1927, when Westinghouse introduced a new A.C. traction motor that was compact enough to fit between the wheels of a locomotive. This new motor opened up development of new and more powerful electric locomotives and it gave impetus to the PRR's plans for electrification. By 1928, the overhead wires reached Wilmington, DE to the south and by 1930, Trenton, NJ to the north. In 1931, it was decided to electrify the railroad from Washington, DC to Penn Station in New York City. With the commitment made to electric motive power it still remained that a main line passenger locomotive had to be developed. From the time the PRR decided to electrify the main line, it began to experiment and test new locomotive designs. Shortly after Westinghouse introduced the new traction motor, the PRR was testing three prototypes; the L-6, a 2500 HP, 1-D-1 for freight service and two passenger locomotives, the O-1, a 2500 HP, 2-B-2 and the 3750 HP, 2-C-2, P-5. After testing two prototypes of the L-6 design in 1932, it was decided to order fifty of them. The Lima Locomotive Works built the car bodies and the running gear and shipped thirty each to the Altoona Shops where the electrical components were to be added. A total of eight prototype O-1s were built and tested in pairs with each pair having slightly different electrical characteristics. These locomotives which were built in 1930 and 1931 had high drivers and were relatively light weight. As a result they experienced slippage and the design was rejected in favor of the P-5 design. In 1931, two P-5 prototypes were built and tested and shortly after an order was placed to build ninety more. 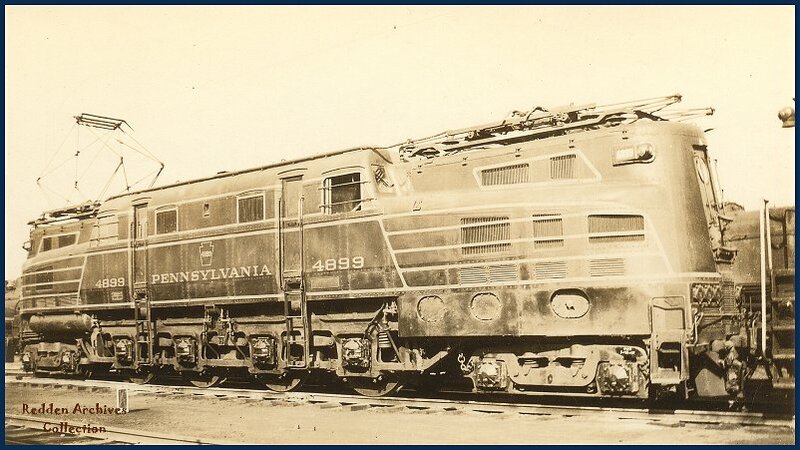 On January 16, 1933, a new production P-5a (the production design differed slightly from the prototype and a small "a" was added to the designation) was delivered and assigned to pull a passenger train from Philadelphia to New York City. Beginning then, serious design flaws appeared: tracking was not what was hoped for, lack of power occurred when more than ten cars were in the consist and cracks developed in the drive axles. One more design problem surfaced when a box cab P-5a struck a heavy truck at a grade crossing killing the engineer. This accident put a hold on the production of the remaining twenty-eight P-5a locomotives left to be delivered. A revision was made to the design and the remaining P-5a units were delivered as streamlined center-cab locomotives. It became clear that the P-5a was not going to be the main line passenger locomotive and it was moved to freight service. At that time work on the L-6 was halted and none of the thirty that were being built ever left the shops at Altoona. A test track had been built near Wilmington, DE to analyze the P-5a problems and in 1934 the PRR leased a NYNH&H Class EP3a (2-C+C-2 box cab) and brought it to the test track. Extensive testing found it to be far better tracking than the P-5a. The PRR was impressed enough to order a prototype locomotive built using the EP3a wheel arrangement. This locomotive was designated as Class GG1 and it had a streamlined center cab similar to the last P-5a built and it carried number 4899. Another prototype was also ordered. This time, it was a 2-D-2 which was designated as Class R-1 and assigned number 4800. The R-1 had a center crew cab, eight motors, was rated at 5,000 HP and it was geared for 100 mph. The two designs were sent to the test track in August of 1934 and the GG1 outperformed the R-1. After the test track the two prototypes were subjected to main line tests and the GG1 was again found to be superior. The two prototypes were renumbered, the R-1 became number 4899 and the GG1 was given number 4800. Shortly after the tests an order was placed for fifty-seven GG1 locomotives. The order was split between the Baldwin Locomotive Works, the General Electric Company and the PRR Shops at Altoona, PA.
As if planned from the very beginning, when the catenary reached Washington, DC, in 1935, the PRR had a remarkable main line passenger locomotive, the GG1. The prototype, number 4800, was on hand to participate in the inaugural run from Union Station in Washington to Penn Station in New York City.